A paradox sits at the heart of the human rights movement. For decades it has made strong claims about the universality of human rights but then proceeded to present a discounted version of the universality story. Standard historical accounts have privileged the role of western actors, and their perspectives on historical causalities. These have been accompanied by an overemphasis on the 1940s and 1970s in explaining the emergence of human rights—an emphasis that reveals a scholarly addiction to “human rights moments” and iconic histories, instead of more richly contextualized narratives over time. The above-mentioned emphasis has resulted in a huge gap in knowledge concerning the intervening period – covering about 25 years from 1948 to the mid-1970s. In this period, the largest transformation of sovereign power in world history took place, namely decolonization. Surely, this structural transformation in the international system of states played a role in the post-1945 emergence of human rights en route to their contemporary significance? It is surprising how international research has been so ignorant regarding the 1960s developments in the human rights field. Judging from the existing research—at least until recently—the answer appears to be negative. The global South engagement during this period has been described as essentially focused with promoting the right to self-determination. Human rights scholarship was generally speaking content with this profoundly reductionist view. It was forgotten that neither the global South nor UN human rights diplomacy was monolithic. It was always multi-tonal. The effect has been a distorted view of the global South’s role in the emergence of human rights diplomacy, when in actual fact a number of Caribbean, African and Asian diplomats have made innovative and foundational contributions. The reason for this state of affairs lies in the combination of a complacent approach to research that itself is too focused on international legal standards, combined often with a celebratory or commemmorative approach to the historical evolution instead of a more critical approach. In hindsight, it is surprising how international human rights research has been so ignorant regarding the 1960s developments in the human rights field, because a closer look belies a more nuanced and pluralist understanding of this history. The first point to acknowledge is that human rights came in from the South. 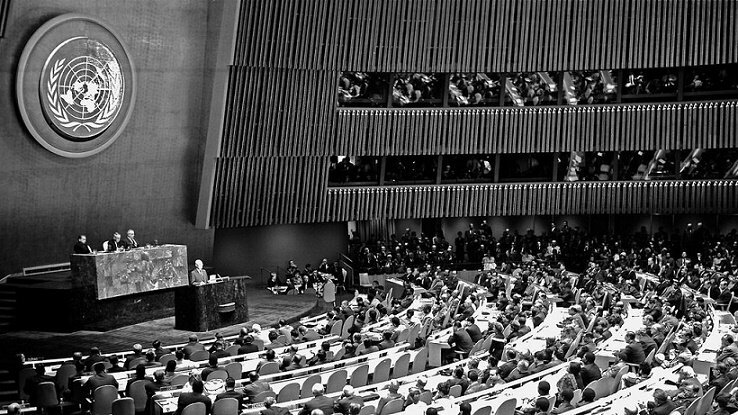 The year 1962 was a major turning point because of an important redefinition of the human rights project around race and religion, and the emergence of an unprecedented momentum and leadership in the field of multilateral diplomacy. The legal and diplomatic breakthrough was brokered by a key group of countries, namely, Jamaica, Ghana, the Philippines, Liberia, Costa Rica and Senegal. These countries pushed the human rights agenda and built alliances at the United Nations for a vital period during the 1960s. They fought for and delivered a stronger human rights system, including with legally binding components, that was in place in the 1970s when Western countries picked up the mantle and began reshaping their foreign policy engagement. Are the global South's contributions to the global human rights movement's early development unduly forgotten? The second point to acknowledge is the need to ensure more representative historical accounts. If we shift attention from “iconic” representatives such as Eleanor Roosevelt onto the Jamaican UN Ambassador (from 1962-1967), Egerton Richardson, we discover perhaps the most significant, yet completely unknown, human rights diplomat in the 20th century and a very different international history. Richardson made Jamaica the global leader in human rights diplomacy within two years of the country’s independence in 1962. He facilitated the first foreign policy strategy (1964) that integrated human rights into a document of this kind—more than thirteen years before the more famous efforts of President Jimmy Carter. The results from Jamaica’s diplomatic efforts are numerous. Their efforts were instrumental in inspiring Amnesty International in 1968 to include the fight against torture in its mandate. They also influenced how Soviet dissidents came to adopt international human rights as a domestic platform against the totalitarian regime they were facing. And it was Richardson’s efforts that led the Teheran World Conference on Human Rights in 1968 to focus on armed conflict. This is by any measure a substantive record—yet it has been completely ignored. The third point to acknowledge is that the global South contribution was foundational with long-lasting legacies that are still with us today. From 1963-1968, a core group of these states initiated a diplomatic effort to develop an international human rights system with mechanisms at the global, regional and national level. They believed such mechanisms were necessary if the United Nations was to function as an organisation for collective security in the post-colonial world. They therefore placed issues such as fact-finding missions, national human rights commissions, treaty body monitoring and regional human rights mechanisms on the UN agenda. Ghana and the Philippines led the process that laid the foundation for the treaty body system in the mid-1960s. They faced much resistance and progress was slow, but this agenda-setting would have a lasting impact. The fourth point to acknowledge is that global South actors from 1962 redefined the international human rights project around racial discrimination and religious intolerance. The standard account has told the post-1945 story as being centred on civil, political, economic, social and cultural rights. This reflects the intent originating at the UN in the 1940s with the development of an International Bill of Rights. Yet race and religion were driving forces on the global human rights agenda from 1962 until 1975, begging a repositioning of how we perceive the human rights story. It was global South actors that placed religion on the international agenda. In that process they both challenged the Communist states and inspired the major Western powers to engage more fully with the emerging international human rights diplomacy. These four points are among the key elements in a much needed re-imagining of the evolution of human rights. It was never just a Western project. It was a pluralist project emerging through a multitude of historical processes with a diverse set of actors involved. This is what human rights researchers and practitioners have failed to acknowledge. For a field of practice committed to inclusion and non-discrimination, it is striking that it is so closely affiliated with such practices of exclusion related to its core tenet: universality. This is a paradox that needs remedying. Rethinking the trajectories that shaped the post-1945 human rights story is now a matter of some urgency for the credibility of the research field and for human rights advocacy itself.